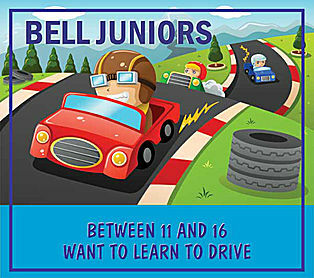 Bell driving school was established in 1995, we have helped thousands of customers pass their driving test. We operate in north London and the home counties.We only use fully qualified DVSA approved Driving Instructors, most of our Instructors have worked for us for over a decade. We offer manual and automatic driving lessons on either a weekly basic or intensive courses. We also provide refresher lessons and lessons for 11 to 16 year olds. We have lessons for under 17 available. These are conducted in St Albans. Daniel passing 1st time with our manual instructor Paul in Hemel Hempstead. Daniel said "Paul has help me pass the test by showing me different ways of dealing with situations"
Rebecca said " Mark is brilliant, very friendly and easy going but not afraid to let you know where you need to improve, he made learning to drive simple and easy. I will now be able to drive to work saving me time in the mornings." Ruby said " I've learnt an essential life skill, i got a great learning experience with Sal. Sal is fantastic, very professional and experienced. He's is very familiar with the driving test format and test routes."